The Vice Chancellor of Adekunle of Adekunle Ajasin University, Akungba Akoko, Ondo State, Nigeria, Professor Igbekele Ajibefun, Saturday, was honoured by the Nigerian Bar Association ( NBA), Okitipupa Branch. He was honoured with an award of excellence as ‘Doyen of Agro-Economy’. 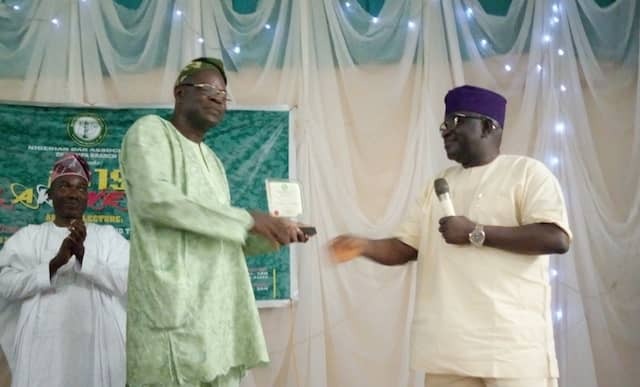 The award, which was conferred on Ajibefun in recognition of his stellar achievements, he received alongside other distinguished Nigerians at the 2019 annual law week of the Okitipupa branch of NBA. Omololu Bagbe, NBA chair of the branch, said Prof. Ajibefun is deserving of the award since he has accomplished so much for humanity as evident in his superlative achievements in public offices. He said: ”Prof. Ajibefun, an astute manager of resources, has been able to achieve steady progress at Adekunle Ajasin University and maintain very peaceful and stable academic calendar in the University even in the face of financial drought. Prof.Ajibefun, in his reaction, expressed appreciation to NBA for naming him for the award. He said he would continue to give his best to the advancement of the society. In his words, I am indeed elated to be given this award by a respected association as NBA. I have received awards in the past but this one is so special to me and I will continue to cherish it. “I want to assure the NBA and people here today that this award will further spur me to do more to the society." Other awardees include; a former attorney general of the federation and minister of justice, Chief Akin Olujinmi SAN; the immediate past provost of Adeyemi College of Education,Prof. Olukoya Ogen; Chief Olusola Oke SAN; Chief Karina Tunyan SAN ; Chief Olajide Ajana; amongst others.